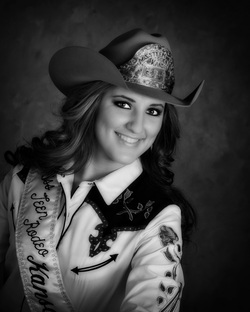 Emily Braun was named Miss Teen Rodeo Kansas 2013 during the Dodge City Round-up Rodeo in August 2012. She received this title after participating in the 4 day pageant which included horsemanship, speech, modeling and personal interviews. Emily was born in Garden City and grew up in the rural Holcomb and Hays, Kansas. Emily currently calls Munjor her home town. Her mother, Cindy Braun, lives in Munjor and her father, Michael Braun, currently resides in Garden City. Emily will graduate from Hays High School in May. She plans to continue her education at Fort Hays State University to obtain an Agricultural Business and Animal Science Degree. During high school, Emily participated in Future Farmers of America. She competed in Livestock Judging placing in the Top Ten for the past 4 years and Horse Judging, placing 4th and 6th in the state the last 2 years. Other activities she has been involved in include debate, drama, basketball and Distributive Education Clubs of America. Emily has previously held the titles of 2008 McCracken Rodeo Princess, 2009 Ellis County Rodeo Queen and 2011 Miss Rodeo Plainville. Emily has participated and received many awards in 4-H showing her horses at the Ellis County Fair and qualifying for the Kansas State Fair. She also showed a market steer and hog and received Grand Campion Crops Exhibitor in 2009. Emily is looking forward to representing the State of Kansas, rodeo and the western way of life as she travels this year. Most importantly, she would like to thank everyone who supported her through the years. Without that support, this opportunity would not have been possible.